Muggy day, lots of bugs, tired legs. Set out pushing 100lbs of kiddo on the trail. It is a gradual decline on the way out...so I cruised pretty easily. The bugs were so bad I swallowed 1 and one flew in my eye, I had to take off my visor because they kept getting stuck. Next time I need to wear sunglasses as a bug shield. The slugs were also gross. -We are in a tank, you take the front I will take the back. It was about 82 so I almost left their sweatshirts in the car, but grabbed them at the last second... MOMMY SCORE! They both were COLD COLD COLD at mile 1.7, quick stop to get them comfortable and off we went. I asked if they wanted to do 4 or 5 miles and they said 5!! They kept me entertained until Mile 3.5 when the Little one fell asleep and my Big Guy pretended to be asleep. My legs were dying, they felt like mush as I pushed myself and the boys up the endless incline. I imagined my last leg of Hood to Coast. I was happy to be done and get in a few miles. The plan was to take the boys to the River and little park as a Reward for being good on the run. Since the Little guy was sleeping Big Brother was solo in the fun.. I took the boys on a Road trip to Tenino, WA to Visit Tall Grandma. I brought loads of snacks and tons of water. We played at the park, tossed the Frisbee, went to a street fair, hopped around on huge rocks, fished out of a big tank and relaxed in the sun. MOMMY FAIL I did not put on their sunscreen.. OOPS!! We were all a bit tosty when we got home. I let them pick out their Dinner of choice from Target freezer section (don't judge I am NOT the cook in the family) LS #1 picked Bagel Bites and LS#2 picked Dino Chicken Nuggets, I had a salad. 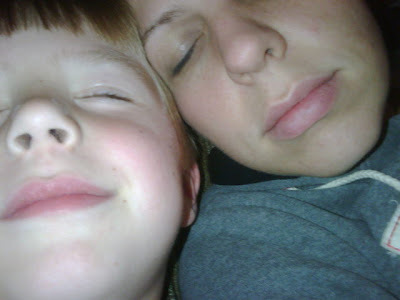 Zoe HERE and I had a tentative plan to meet up for a few miles once my Boys woke up.. I texted her and no reply, I messaged her on facebook no reply.. I was not sure what to do so I hopped on the treadmill to get in a few miles, that way I would have less miles to push the boys. Little Stud #2 wanted breakfast so I stopped and started to get the boys ready. 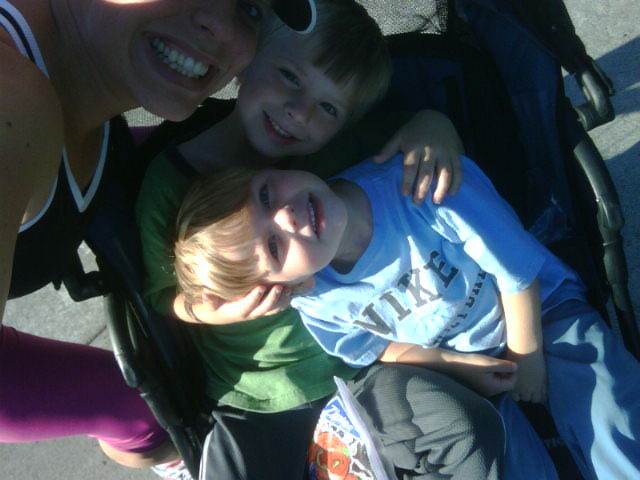 Pushing Boys, trying to avoid people with 2 strollers, a few water stops.. Always a pleasure to see Zoe and the ADORABLE Goober. This time I put sunscreen on the boys, MOMMY SCORE! I also had a few snack and drink options for each of them, DOUBLE MOMMY SCORE! It was funny to have their single jogger with my boys and our double.. We got loads of attention people either commented on us being 'Inspiring" or on the kids "having it easy". It is not easy pushing the stroller and talking. We took a couple water/kid care stops which were much needed. The Little Studs were HYPER, chattering non-stop, and Goober was a total chill baby. Toward the end we saw a hippie looking dude with long grey hair and a long grey beard on the side of the path riding a unicycle....my oldest looked at him and said "Is that a clown?" It was too funny.. Thanks to Zoe for the great run and the photos below..
After the run we had a BIRTHDAY party to go to at my friend Amy's house for her kiddos. It was a Wipeout theme, so I put the kids in their swim gear. Amy lives 1.5 miles away, so I was not too worried about time and offered to get Starbucks for the lovely hostess on my way... Well I forgot that I was SOLO and getting myself and 2 kids ready is no easy task. The party was GREAT, as Little Stud #1 said "Best Birthday party ever!!" There were messy obstacles, a makeshirt water/slippin slide, trampoline, spinkler, cake, hotdogs, and loads of kiddos to play with. I kept a close eye on Little Stud #2, he can get into mischief :) I got to meet Renee one of Amy's friends and my friend on Dailymile, she had also run See Jane Run Half Marathon, it was nice to chat with her and hear stories of small town races and her upcoming adventures. So BLESSED to have my Husband back!!! A few people have asked what I do to keep our boys occupied and in the Stroller... Below are a few tips.. many may seem like "no duh" but I will share anyhow!! 1. Train them early. We have had the boys in the Stroller for runs since our little guy was about 6 months old, so for them it is a routine. 2. Have multiple snack and drink options. I do a couple bags of fishy crackers, granola bars, apples, grapes, etc. I like to have water bottles and juice boxes. This way they have something to do and are not cranky because they are hungry. 3. The DVD player is great for really long runs or when the rain cover needs to go on. Often it end up being background noise because the boys are too busy looking around. I have heard other folks having music players for their kiddos. 4. Create games, counting, ABC's, singing, or simply point out things along the path. Make it fun!! Talk to your kids and point out fun things along the way. 5. Have planned breaks or chances for them to get out and RUN.. Letting our boys know that they will have a chance to get out and run helps them not feel stuck in the stroller. 6. 1 toy per person. Pick a toy like a car, transformer, book, etc... but only 1 because there is a chance that the toy will end up on the ground and you will have to stop to pick it up. 7. What do we do after the Run? A reward for after the Run is a good thing. Maybe there is a park or river they can play in when you are done?? We are blessed to have a GREAT kid and stroller friendly trail with a park. Maybe when you get home they can have a Popsicle or a smoothie.. Whatever the reward, remind them that they can earn the reward by being good during the run. 8. Chose the time of day wisely. You know your kids and when they are the most hyper, this is NOT the time to strap them in a stroller. We like to run around nap time, then tell them to sit back and relax.. Often our little guy falls asleep, SCORE!! 10. Meet their Basic Needs. Keep your child warm, dry, fed, entertained and let them know how long they will be in the Stroller. Planning ahead for any meltdown will make your Run much much better!! Anything I missed? Leave a comment!! It sounds like you do a GREAT job while your hubby is away! I love how the kids enjoy being along for your runs. It is not a chore but something they look forward to! What a great way to get in your runs and have some quality family time. Way to go! Sounds like you made out very well with MM away! Awesome job getting some runs in with all the Mommy duties too! AWESOME post, thanks for the stroller tips. Hopefully I will need them someday ;). Great job on those runs with the kiddos. 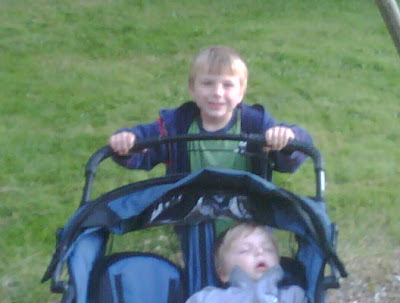 I used to run with my oldest in the BOB stroller. It was fun and I would bribe her with a trip to the playground when we were done! 2 boys in the stroller - WOW! I won't complain about my one 36lb int he storller which she is getting to tall for. I agree with all your suggestions though. Sometimes instead of a DVD we use her explorer or other handheld game to distract her while we run. OMG, I was about to pee my pants when Stud 1 said that! Hilarious! Do they ever throw their toys/drinks/food out of the stroller? Has someone invented some type of bungee device to prevent "fly away" toys/drinks/food from strollers? Just curious. I hope to tackle the joy of a jogging stroller some day :) Hopefully sooner than later! I hope one day to have the chance to push a baby stroller while running. Hehe. I ran a 10K once where a guy pushed his two boys the whole race. It was a small local race, but he still managed to finish in the top 3 (he's crazy fast). I can imagine it's quite a challenge! Your boys are adorable! Your run with Zoe and Goober sounded great! I've never run with someone else also having a stroller. That has to be a navigating nightmare! "wide load coming through" heehee It bet it was like one of those adventure races. Kids in strollers? It's a run-to-run thing. One day they love it. One day they don't. Here's to full cups of goldfish, endless drink boxes and toys that don't trip you when the kids throw them out! We just got our jogging stroller, so I'll have to try it in the fall. That might be a good afternoon run. Way to go Single Mommy!! I bet the boys LOVED having special time with you!!!!!! And I love the "I remember when daddy was here" comment! Heard that one a TON of times! Their time concept is so skewed it's funny!!! SO proud of you for getting your runs in too!! AND SERIOUSLY that stroller!! I think you all are nuts for still using it!! In a good, amazing super-hero kind of way!! That is NO JOKE hardcoreness right there!! It was nice to meet you- Mel!! I enjoyed chit-chatting with you, and hope we can do it again! So, I followed your blog for awhile, but have never posted (this is my first). So, my last one is down as unknown, but it was me - Renee (lol)! I will get the hang of it! I truly enjoyed meeting, and hope we can all hang out again - including kiddos! !